To set the mood: Come Home by Baynk. A most stunning sunset of Dorm Row my first week back. #nofilter. The past month has been quite the eventful return back to the Institute. It’s odd how quickly everything felt familiar again. Even after being away for over 9 months, Boston still feels like home. I spent the first few days moving my stuff from storage into an off-campus apartment and settling into a new pace of life, an expat readapting⁠01 Refer to last section: <em><a href='https://www.ethz.ch/content/dam/ethz/associates/students/studium/auswaerts-studieren/culture-shock_outgoing.pdf'>Returning Home</a></em>. to home base. Luckily, I had a friend who rented a Zipcar van and helped me move last minute on Labor Day. Classes started out fast, but I managed to keep up the first week. This semester, I’m taking 6.046, 6.810, 7.012, and German II. I don’t know if it’s experience, but classes seemed more manageable, less overwhelming to start. Of course, you can only fool yourself for so long that you have it all figured out. One week in, I was back to being hosed again. There was so much I needed to do. Picking classes, dropping classes, meeting with my advisor, attending welcome-back meetings, more meetings, this and that, cancelling my storage contract, setting up electricity for my new apartment, getting my skates sharpened, getting a haircut, figuring out transfer credit forms. This past week, I was really hosed. The psets started to pile up: 3 for 6.046, 1 for 7.012, daily assignments for German II. I had my first midterm⁠02 Does that even count as a midterm? in 7.012 this week. I spent over 5 hours in the shop laser cutting and bending acrylic for 6.810 one evening. This past week I left for campus at 8:45am for German at 9am, and often didn’t return until past midnight, bouncing from class to class, office hours to office hours, library to library, pset to pset group, school to the rink and back. I had forgotten how stressful of a place MIT could be, how much everything is thrown at you at once, even if you’re intentionally about finding that balance, the sweet spot. I’ve forced my thinking caps to engage at max throttle, trying to connect the dots and synthesize as much as I can—that is, fast Fourier transforms in 6.046, adaptive learning in 6.810, amino acids in 7.012, and adjective endings in German. Staying on top of classes and all is a full-time commitment. School has no bounds; work becomes life around here. While frantically dashing from building to building along the Infinite or the tunnels, I’ve run into so many people I hadn’t seen in nearly a year. Many hellos, how are you, how have you been, let’s catch up soon! Many new faces, too. 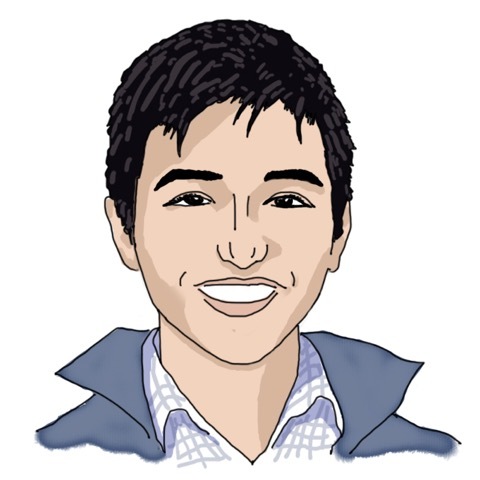 There’s now 3 classes under me, and another set of freshmen I don’t know.⁠03 The past two years I had been a counselor for the <a href="https://www.eecs.mit.edu/outreach/discover-ee" target="_blank" rel="noopener">Course 6 FPOP</a>, and through <a href="http:www.mitifc.com/" target="_blank" rel="noopener">Rush</a>, I would meet a good number of the incoming class. This year I didn’t partake in either. For my final year at MIT, I’m ready to do it smarter, not harder. I’m starting the year with a fresh slate, a new mindset, a new perspective. Overall, I just want to enjoy it, take it all in. 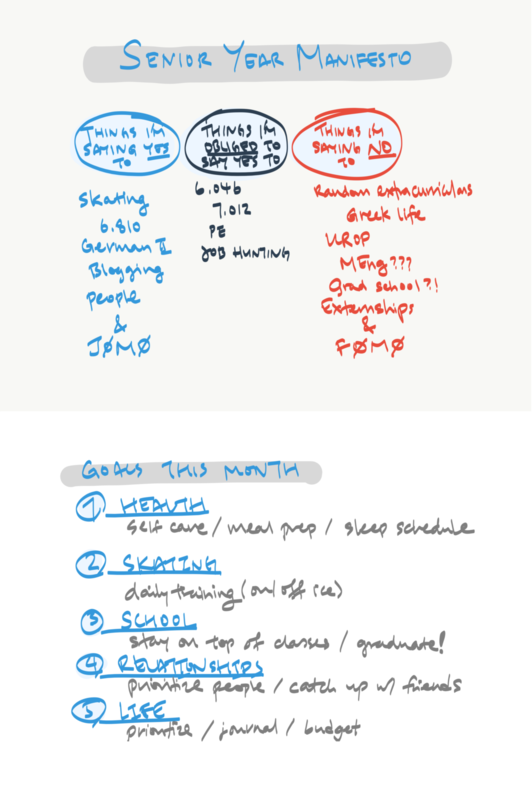 I want to be deliberate in the opportunities to which I say yes, or no, and honest with myself the things I can’t run away from.⁠04 Read: 6.046, 7.012, one more PE class, finding a full-time job. To that end, I put together a Senior Year Manifesto, edicts that I hope to follow to guide my decision making and priorities. My Senior Year Manifesto: all the things to which I’m saying yes, an obliged yes, or a firm no. Also, my goals for the month. 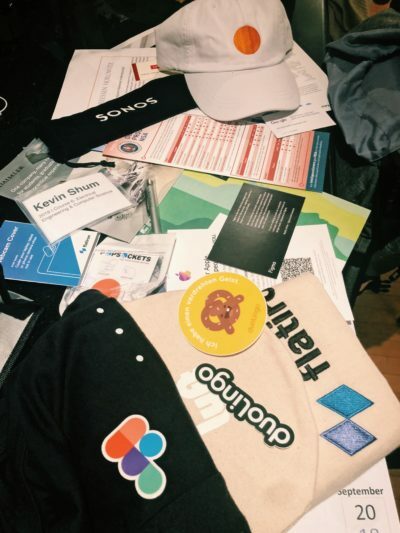 Yes to JOMO, no to FOMO! The second week of school, I performed at Harvard’s An Evening with Champions (EWC) for the fourth time. Organized by Harvard undergraduates, this was the 48th rendition of the show with a lengthy legacy, spanning 26 Olympic Champions and over $2.9 million raised for the Jimmy Fund in support of the fight against cancer. 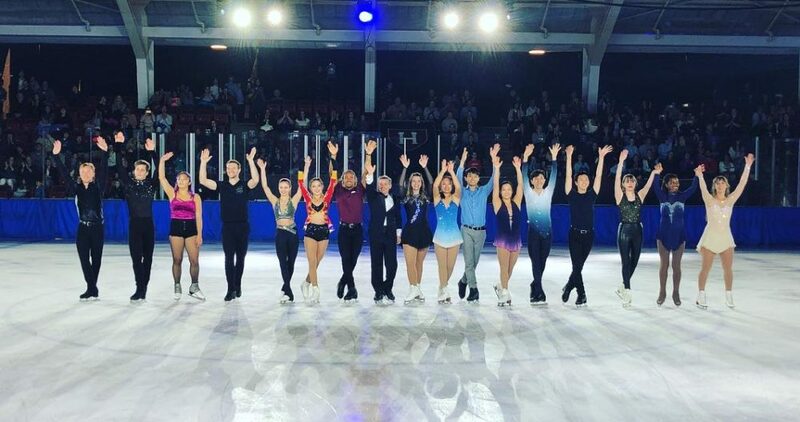 This year’s cast included several elite international athletes, National Champions, and Olympians, including two PyeongChang athletes. The show consumed half of the week between the Gala Dinner at Elliot House, night-long rehearsals for the opening and closing number, and shows Friday and Saturday evening. In between warmups and show numbers backstage, I tried my best to catch up on my classes and pset (I even got some help from some of the organizers who concentrate in biology). Here’s a recording of my performance during the Saturday show. Shoutout to all the MITs who trekked across the river to come support and watch this year’s EWC! The cast of Harvard’s 48th Evening With Champions. 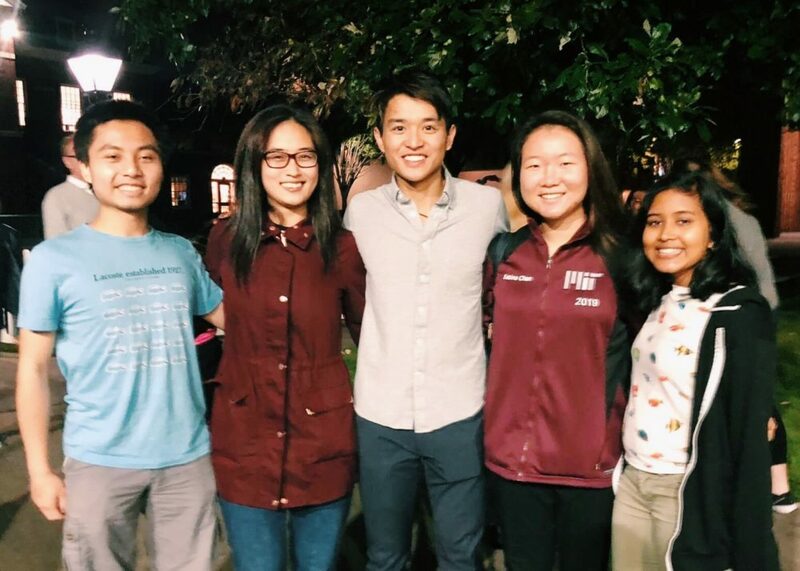 Friends from the MIT Figure Skating Club: Jon L. ’18 (visited from NYC! ), Diane Z. 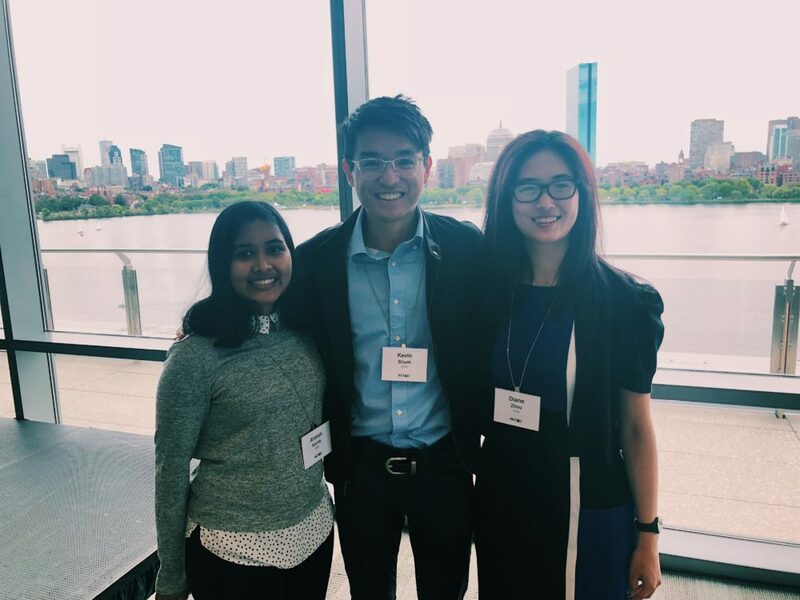 ’19, Sabina C. ’19, Ananya N. ’19. Picked up some goodies during (my last?) Career Fair. Last Friday was Career Fair. We didn’t have classes, but I didn’t expect to spend much time there. Somehow I ended up talking to companies and roaming around from 11a to 4p when it ended, with a 30-minute lunch break in between. #tbt to my first career fair. I still need to figure out what I want to do with my life. Should I MEng? Or work full-time? And if so, in what, where, how, why, when? So many questions, so few answers. 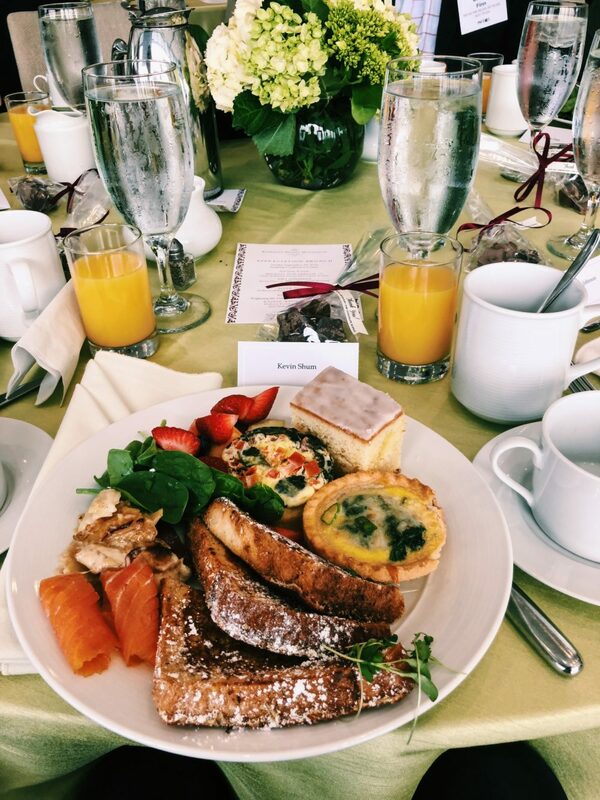 Sunday morning I had the opportunity to attend the Katharine Dexter McCormick Society (KDMS) Appreciation Brunch. Rainer Weiss ’55, PhD ’62, gave the keynote, “Exploring the Universe with Gravitational Waves,” and talked about his work on gravitational waves and LIGO that earned him the Nobel Prize in physics. 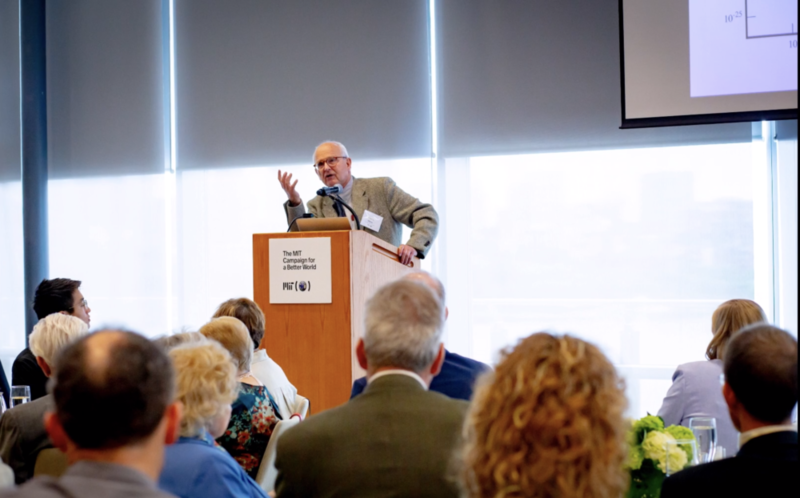 KDMS honors those who have made planned gifts and bequests to come to MIT after their lifetimes. In addition to founding a women’s dorm at MIT, Katharine Dexter McCormick (1904) committed her life to biology, activism, and philanthropy. 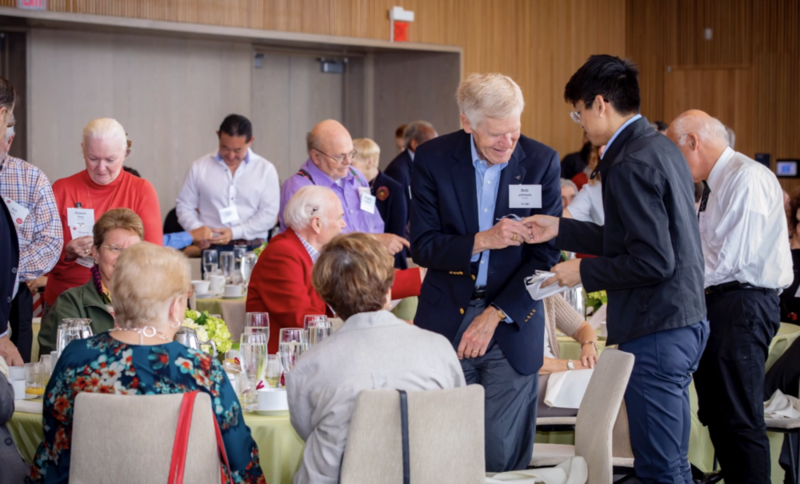 The brunch is organized in appreciation of the generosity of the donors who contribute to the largest source of income for MIT’s endowment and provide scholarships, financial aid, and other resources for us as undergraduates. Professor Weiss introduced his work with an overview of Einstein’s general theory of relativity, and continued with his collaboration with Caltech’s Kip Thorne to build the Laser Interferometer Gravitational-Wave Observatory (LIGO) research project. He also shared the story behind and groundbreaking findings from the first detection of a gravitational wave—the famous “chirp”—on September 14, 2015, along with further findings from gravitational waves caused by neutron star collisions, and a look at the future of gravitational wave research. I had a chance to sit at the same table as Dr. Weiss during the appreciation brunch. I was blown away by hearing all sorts of stories from him and our alumni and all the extraordinary things they’ve accomplished throughout their lengthy careers. I got to compare brass rats. An alumnus even showed off a piece of history: a deck of MIT-branded punched programming cards. Ananya N. ’19, Diane Z. 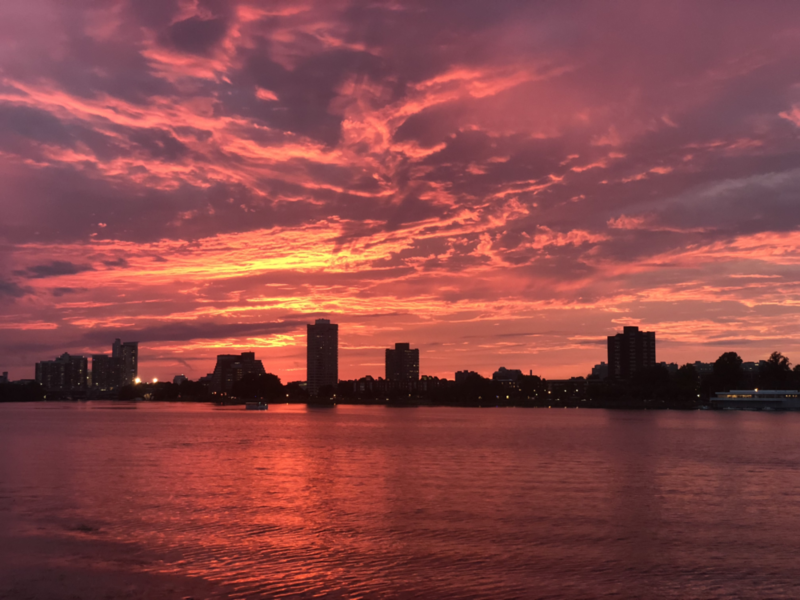 ’19, and I soaking in the most stunning end-of-summer views of the Boston skyline from the Samberg Conference Center, Chang Building (E52). Handing out commemorative KDMS pins. Photo taken from KDMS. Rainer Weiss ’55, PhD ’62, giving the keynote, “Exploring the Universe with Gravitational Waves,” and discussing his work on his Nobel Prize-winning research. That’s me in the bottom left corner, engrossed in his talk. Photo taken from KDMS. Monday was Mid-Autumn Festival (中秋節), but I barely had any time to celebrate. I had two lectures in the morning starting at 9am, stopped by the Microsoft Cambridge office for an open house, had lunch with a family friend, skated one session, rushed back to campus to meet with the MISTI Germany program manager, attended a blogger checkin, ran over to the Google Cambridge office for another open house, snuck into the tail end of 6.046 office hours, moved to the Stud to pset with friends, and then ubered back to my apartment with only a few minutes to spare before midnight to eat some mooncakes with my roommate and call my mom before falling asleep to start it all over again. That was just the start of the week. This week, in addition to the 6.046 pset that still makes no sense, I had a 7.012 exam and a German quiz, plus a technical proposal due for 6.810. This past month has been quite the back-to-school experience. I somehow feel like both an adult and freshmen at the same time. I’m now 3 years removed from the 2022’s, but I’m taking 7.012 with them and 6.046 with mostly sophomores and juniors. I walk through campus passing by new sets of unfamiliar faces with the occasional familiar one. 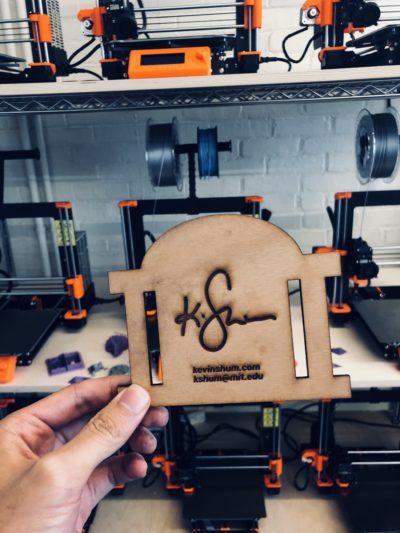 Learned how to laser cut for a 6.810 pset. I’m now 21 but still haven’t gone out to a bar in Boston, though I’ve been itching to hit up the Muddy. I’m figuring out rent and utilities and living in a building with working professionals and families, but I spend my evenings in office hours, picking up free food along the way, and late nights in the Athena Clusters at the Stud. I’m sleeping earlier and waking earlier, thanks to my first 9am of my undergrad career, 4 times a week, too. I’ve been approaching this strange inflection point in my life, trying to become an Adult but still struggling as an Undergrad (who still needs to Graduate). It’s been three years of trial and error figuring out How to MIT, and I’m still trying to figure it all out. But there’s beauty in the process, too, as I’m giving it one final go.⁠05 Or MEng?! 25 days down, 250 more to come. With that, here is Part 1, Senior Year Edition.